If you are transferring your sales tax information through Commerce Sync, you'll need to have your Sales Tax enabled in QuickBooks. Below are instructions on how to enable Sales Tax in QuickBooks Desktop, how to add or edit your Sales Tax Rate and how to add or edit a Combined or Group Tax Rate.After you have made these changes in QuickBooks, you'll need to turn on the Transfer Sales Tax feature in your Commerce Sync account. See steps below. Go to Edit > Preferences. The preferences dialog appears. In the left hand navigation panel, click Sales Tax. Beside Do you charge sales tax?, click Yes. From here click the Add Sales Tax Item button to open a new window where you can select a name, rate, and agency. After initial setup, you can access your Tax settings easier by selecting the Manage Sales Tax icon that now appears in Home > Vendors. 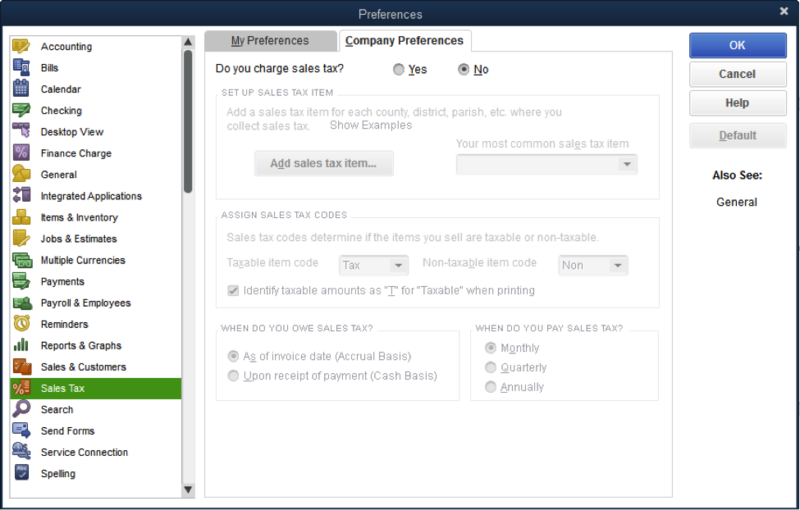 When creating a Tax Rate in the Preferences dialog, select Sales Tax Group item. Again, after you have made these changes in QuickBooks, you'll need to turn on the Transfer Sales Tax feature in your Commerce Sync account. Read more about Settings for QuickBooks. Click Save/Retry at the bottom of the screen.